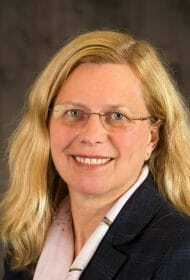 Policy changes have implications for both equity plan voting and director over-boarding. ISS has changed its methodology for assessing treasury-based incentive plans with effect in 2016. In addition, both ISS and Glass Lewis have changed their standards for director “over-boarding” with effect in 2017. 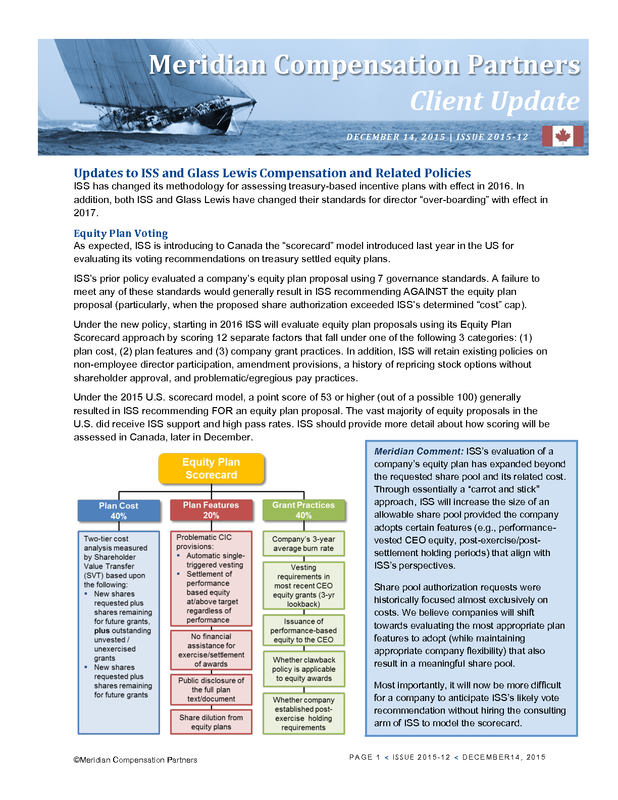 As expected, ISS is introducing to Canada the “scorecard” model introduced last year in the US for evaluating its voting recommendations on treasury settled equity plans. ISS’s prior policy evaluated a company’s equity plan proposal using 7 governance standards. A failure to meet any of these standards would generally result in ISS recommending AGAINST the equity plan proposal (particularly, when the proposed share authorization exceeded ISS’s determined “cost” cap). 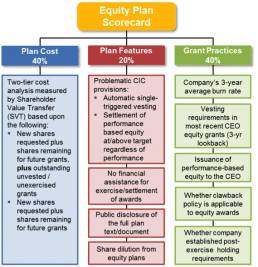 Under the new policy, starting in 2016 ISS will evaluate equity plan proposals using its Equity Plan Scorecard approach by scoring 12 separate factors that fall under one of the following 3 categories: (1) plan cost, (2) plan features and (3) company grant practices. In addition, ISS will retain existing policies on non-employee director participation, amendment provisions, a history of repricing stock options without shareholder approval, and problematic/egregious pay practices. 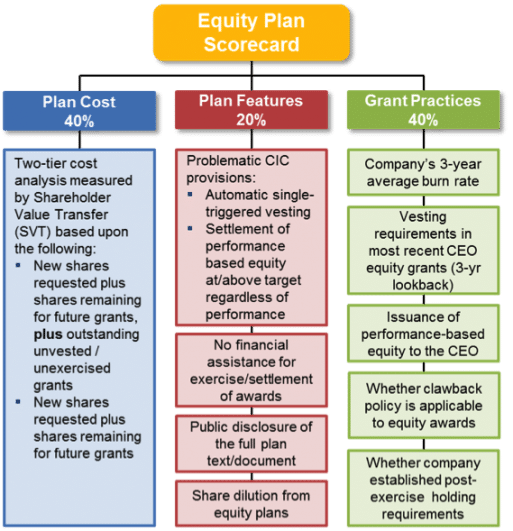 Under the 2015 U.S. scorecard model, a point score of 53 or higher (out of a possible 100) generally resulted in ISS recommending FOR an equity plan proposal. The vast majority of equity proposals in the U.S. did receive ISS support and high pass rates. ISS should provide more detail about how scoring will be assessed in Canada, later in December. Meridian comment. ISS’s evaluation of a company’s equity plan has expanded beyond the requested share pool and its related cost. Through essentially a “carrot and stick” approach, ISS will increase the size of an allowable share pool provided the company adopts certain features (e.g., performance-vested CEO equity, post-exercise/post-settlement holding periods) that align with ISS’s perspectives. Share pool authorization requests were historically focused almost exclusively on costs. We believe companies will shift towards evaluating the most appropriate plan features to adopt (while maintaining appropriate company flexibility) that also result in a meaningful share pool. Most importantly, it will now be more difficult for a company to anticipate ISS’s likely vote recommendation without hiring the consulting arm of ISS to model the scorecard. Both ISS and Glass Lewis are changing the limits for directors to be considered over-boarded. Glass Lewis is changing its policy for 2017, and for 2016 will note as a concern where directors exceed the new 2017 limits. ISS is changing its policy for 2017 and will add cautionary language where a director is “over-boarded”, but attends more than 75% of meetings. Meridian comment. The one year grace period is designed to allow companies to make an orderly transition of over-boarded directors. Glass Lewis has expanded its guidelines around sign-on arrangements. These arrangements should be clearly disclosed with a meaningful explanation of the payments and how the amounts are reached, including details and basis for any make-whole payments for forfeited awards from a previous employer. Glass Lewis has enhanced its board responsiveness evaluation to include that compensation committees and boards should demonstrate some level of engagement and responsiveness to significant levels of shareholder opposition (defined as 25% or greater) to their say-on-pay proposal. ISS will generally recommend against say-on-pay for companies with an external management structure if there is not enough disclosure for ISS to analyze pay-for-performance.